Tri-Mack's hybrid panel is fabricated in a robotic injection-molding cell that forms the composite geometry and produces a multi-piece assembly, including hardware, right from the mold. Photo courtesy of Tri-Mack Plastics Manufacturing Corporation. BRISTOL, R.I.–Tri-Mack Plastics Manufacturing Corporation is sharing the results of a recently completed test that demonstrates the bond strength of Tri-Mack's overmolded thermoplastic composite hybrid parts. The comparative test, similar to the ASTM 4501 Block Shear Test, was conducted by the company with test coupons manufactured in-house. The data helps validate the performance of hybrid composites, which are of particular interest in aerospace and other industries where the goals of lighter weight and lower cost are driving material innovation. Tri-Mack is supporting this trend with innovative hybrid processes that combine injection overmolding for design flexibility with unidirectional thermoplastic composites for strength and stiffness. 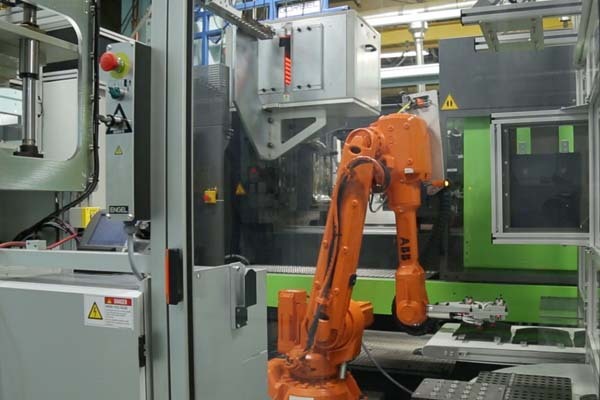 Tri-Mack's hybrid panel is fabricated in a robotic injection-molding cell that forms the composite geometry and produces a multi-piece assembly, including hardware, right from the mold. To answer the question "How strong is the overmolded bond?" Tri-Mack tested the strength of hybrid overmolded coupons, all-laminate coupons (to establish a baseline), and laminate coupons bonded together with industry-standard thermoset film adhesive. The company's hybrid parts address a key customer demand–engineers can bypass costly and slow-to-produce thermosets and heavier machined metal components. This means lighter, stronger parts and assemblies get to market faster and help alleviate the delivery delays experienced by major carriers, transport, and defense companies. "Aircraft manufacturers face huge backlogs, and some of this is attributed to supply chain capacity and coordination," said Tom Kneath, director of sales and marketing at Tri-Mack, in a press release. "But innovation in part design and commitment to technology can help to solve these problems. Our hybrid parts are an example of meeting expanded functionality requirements and customer business goals in one stroke. "We're able to eliminate costs, improve material performance, and shorten lead times," he continued. "This starts with the Tri-Mack process for manufacturing overmolded hybrids. We've reduced the number of process steps and can produce a finished part with a fast cycle, resulting in a lower cost of conversion. In addition, the hybrid process enables us to take a component that may have been made up of six individual pieces and now create the integrated assembly right out of the injection mold. For our customers this means lower part count, reduced prices, and supply-chain efficiency." Tri-Mack Plastics Manufacturing Corporation (www.trimack.com) is an engineering and manufacturing company specializing in high temperature thermoplastic and thermoplastic composite parts. Tri-Mack's capabilities include automated thermoplastic composite processing, injection molding, tool making, multi-axis machining, bonding, and assembly. The company is ISO 9001:2008 and AS9100 certified, and serves the commercial aerospace, defense, and industrial equipment sectors.